Businessmen who want to export coal from Oakland promised to pay money to environmental groups and churches in exchange for their support. On Monday, businessman Jerry Bridges defended his plan to export coal through Oakland. In a series of quiet meetings, the businessmen behind a plan to export millions of tons of coal from the Oakland waterfront have offered local churches and environmental organizations money in exchange for their support, the Express first reported on its website on Monday. According to several sources with firsthand knowledge of the meetings, Jerry Bridges and Omar Benjamin, both former Port of Oakland executive directors who now lead Terminal Logistics Solutions (TLS), the private company that wants to export the coal from the redeveloped old Oakland Army Base, met with leaders of West Oakland environmental organizations and several churches to offer them potentially millions of dollars if they would agree to back their plan. Bridges and a paid lobbyist have also been speaking at influential Oakland churches to rally support for coal. According to Brian Beveridge of the West Oakland Environmental Indicators Project, Bridges, who is the president and CEO of TLS, and his business partner Omar Benjamin, who is senior vice president of the company, contacted the environmental group about two months ago and asked for a meeting. Beveridge and Margaret Gordon, also of the environmental group, met with Bridges and Benjamin for lunch at Nellie's Soulfood Restaurant and Bar near the Port of Oakland. "They said they'd be willing to offer us twelve cents a ton of coal [shipped through Oakland], placed into some kind of community fund that the community could do with as they please," Beveridge said. "They suggested, ironically, it could support a health clinic, but I think the irony was lost on them. They said they'd be happy if we managed that fund, and they'd give our organization this money to do that." In July, Bridges told KQED that he hopes to ship approximately 4.2 million tons of coal a year from Utah through the bulk commodity terminal planned for construction at the Oakland Global site. According to the US Energy Administration, Utah coal currently sells for about $39.75 per ton. Therefore, at current prices, the value of the coal TLS wants to export from Oakland would equal about $166 million a year in value. Twelve cents on every ton, if it were used to pay off environmental groups, would generate roughly $500,000 a year. Bridges and Benjamin of TLS did not respond to multiple phone calls and emails seeking comment for this report. Beveridge said that he and Gordon turned down the offer. "Others have used the 'bribe' word, but I wouldn't say it was that," said Beveridge. "They were saying, in their context, they want to give the community some kind of benefit, and I understand they're now offering that to other organizations in the community. "As much as money is important," Beveridge continued, "we weren't going to sell our voice for something we knew up front wasn't good for us." According to Oakland City Council President Lynette Gibson McElhaney, who represents West Oakland, where the coal export terminal would operate, Bridges also recently met with the pastors of several churches in an effort to gain their support for coal exports, again with the offer of money tied to each ton of coal shipped through the Oakland Global bulk terminal. "Churches have said to me that he was creating a community fund that they could tap into," said Gibson McElhaney in an interview. "Seven cents a ton — that's what ministers reported to me." Gibson McElhaney said last week that she has tried to avoid discussing the coal issue with lobbyists from all sides before Monday night's public hearing on the subject, but the controversial issue keeps popping up. "Everybody wants to see the Army Base producing jobs, and that's the spirit we're moving forward in, but we have an obligation to consider public health and safety, and to regulate any risk to public health and safety," she said. Supporters of the coal export plan tout the jobs that would be created from building the terminal and shipping millions of tons of fossil fuel to overseas markets. TLS also claims that it will build a state-of-the-art enclosed coal warehouse with covered conveyor belts, all fed by enclosed rail cars, to minimize fugitive coal dust that might be blown into the surrounding community, or which would expose workers to toxic materials. In a July 15 letter to Oakland Mayor Libby Schaaf, Bridges called the type of coal his company wants to ship "low-sulfur," and "among the cleanest burning coals in the world." In advance of Monday night's city council hearing, CCIG, the master developer of the Oakland Global Project, submitted a report prepared by HDR Engineering that claims that "the amounts of coal dust emissions to the City of Oakland resulting from transport of coal ... and related terminal operations will be negligible, and that impacts from coal dust emissions and deposition will not harm health or the environment." Opponents cite the environmental and health impacts of the coal industry, especially dust blown from trains and silos into surrounding communities. They have pointed out that there have never been health and safety studies of shipping coal in the types of train cars and terminal equipment that TLS has said it will use. Indeed, there are no covered rail cars used to transport coal anywhere in the United States today. Critics also say that enclosing coal in cars and silos could pose explosive fire hazards. Opponents also say the plan is economically risky because US and overseas markets for coal are shrinking as regulators here and abroad try to reduce carbon emissions. And then there's the problem of greenhouse gas emissions. In a letter submitted to the Oakland City Council and the mayor on Monday morning, the No Coal in Oakland coalition of neighborhood and environmental groups wrote that the scale of fossil fuel exports from the project would be so big it would have measurable climate change effects on a global scale. According to the groups, if one assumes that TLS exports the maximum allowable coal from the terminal for the 66-year term of its lease, it would ship about 660 million tons of coal to overseas power plants. These coal-fired plants would burn it and then release as much as 1.5 billion tons of CO2 into the atmosphere. "The City Council is now considering the health and safety impacts of facilitating the release of over a billion tons of CO2 into the atmosphere," stated the groups' letter. "The incremental amounts of atmospheric carbon that will drive climate change are measured in billions of tons. A billion tons matters." In his efforts to drum up support for coal exports, Bridges has avoided discussing the issue of climate change and stuck to the message of jobs. The promise of jobs, even dangerous ones associated with shipping coal, resonates with many in Oakland's flatland communities. West Oakland's unemployment rate is 16 percent for the total population and 29 percent for Black residents, according to the US Census. To deliver this message to churches and community groups, Bridges hired lobbyist Darrel Carey, according to several sources. Carey runs a group called the East Bay Small Business Council and is the cousin of Zachary Carey, the pastor of True Vine Ministries church in West Oakland. 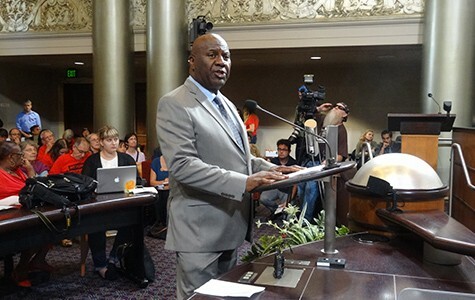 Darrel Carey has also written op-eds in the Oakland Post, a Black-owned newspaper, supporting the coal export plan, and attended multiple community meetings to speak in favor of coal and jobs. Carey also recently scheduled a "coal transport education" meeting at True Vine Ministries, but the meeting was cancelled, Carey told me at Monday night's council hearing on coal. Bridges has also been speaking before church congregations about the positive economic impact that building and operating the terminal will have on West Oakland, according to church attendees. Oakland resident Dag Sibhat said he was at Acts Full Gospel Church several weeks ago when Bridges took the stage for several minutes to promote coal exports from Oakland. "The pastor said he wanted everyone to sign on and support him," said Sibhat about the introduction given to Bridges. "They made him seem like he was an African-American businessman who was trying to succeed in the world, but they didn't state it as, you know, 'He's a representative of the coal industry.'" According to Sibhat, Bridges described himself as a former senior executive of the Port of Oakland and said that coal exports from the new terminal would be environmentally safe because of new technologies and designs. He drove home the message that coal would provide jobs. "He didn't say anything specific or detailed about the design, just that it was going to be 'revolutionary,'" said Sibhat. "That's why I was questioning his claims. I know the low-income areas would get jobs from this, but the whole safety and environmental thing is important, and a lot of people do take advantage of low-income communities." 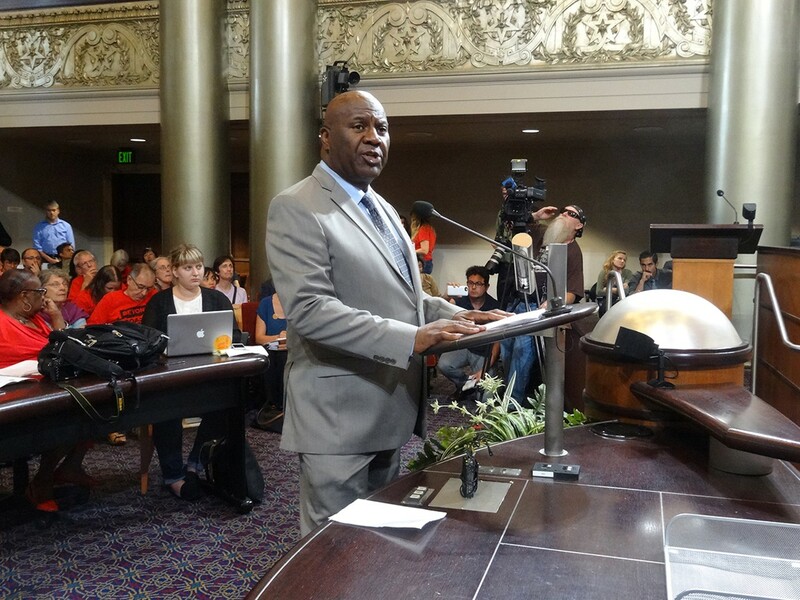 At Monday's council hearing on coal, Pastor Kevin Hope of Acts Full Gospel, an East Oakland church, told me he was unaware of any offer of money by Bridges to Hope's church in return for its support for the coal project. At Monday's hearing, Hope backed the project. Monday's hearing ended late after approximately seven hundred speakers signed up to address the council (many people ceded time so their representatives could speak at length). The council ultimately approved a motion by Councilmember Dan Kalb to extend the public hearing on coal until October 5. Kalb invited members of the public to continue submitting comments and expert evidence on the health and safety impacts of coal until that date. The council will then make a final decision by December 8 on whether to prohibit coal in Oakland.